The author and painter discusses her ‘comics-adjacent’ books on the City of Lights. 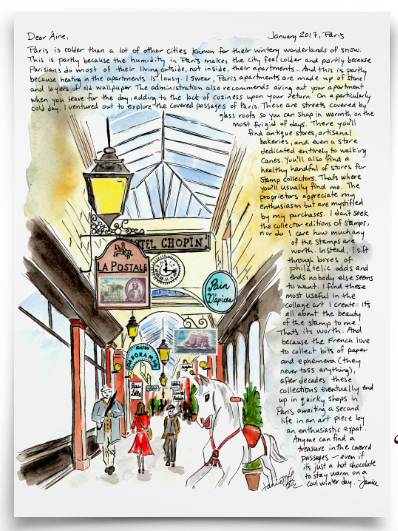 Janice Macleod doesn’t make comics, but her Paris Letters are clearly comics-adjacent. For years she’s been painting images of Paris and elsewhere and combining it with text, a story or her own observations about the place or events. 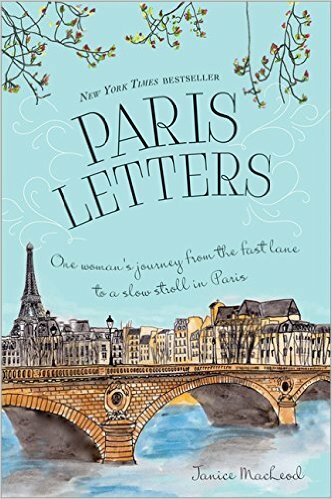 She detailed the story behind how she ended up in Paris, crafting these letters and selling them through etsy in her bestselling book Paris Letters. The book is essentially a how-to guide for leaving your job and becoming a flâneur in Paris, a description she enjoyed. 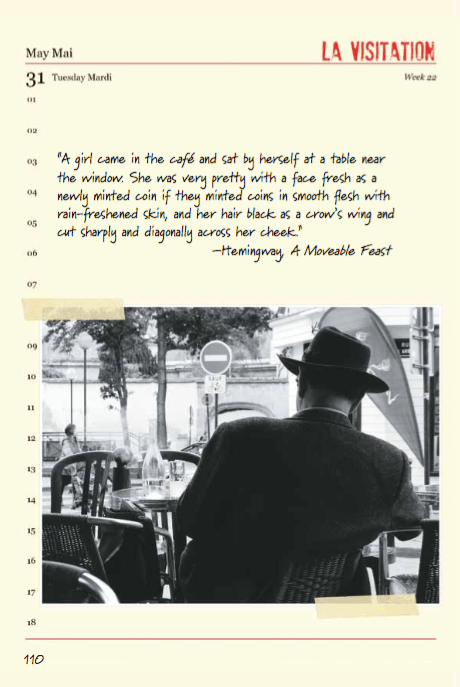 Her new book is A Paris Year, which is an artist’s book, a datebook-like volume of drawings, photographs and stories about the city. I really loved A Paris Year and do you want to start by saying a little about what it is, because this is an artists book at heart, I think. Janice Macleod: In a recent radio interview, the host asked me to describe it in two sentences. I said “It’s a travel journal about Paris.” Then dead air. That was awkward. 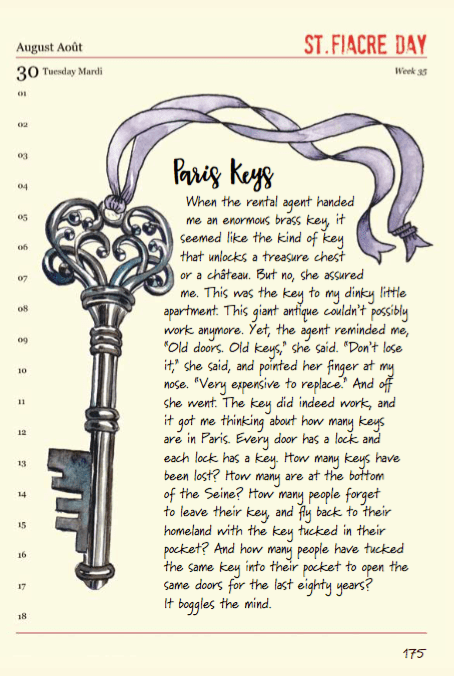 But truly, A Paris Year, at it’s heart, is a well-curated version of my very messy journals where I house my sketches, paintings, interesting facts about Paris, and short stories. 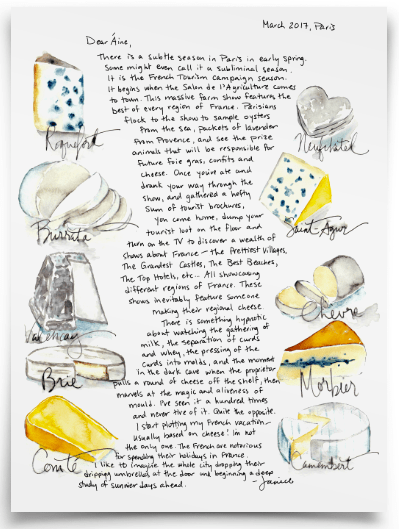 Some of these juicy travel tidbits became Paris Letters. These are painted letters I create and sell on my Etsy shop to Francophiles who crave fun mail about this iconic city. When recreating the travel journals, I added photos I had taken along the way. Sometimes a sketch was better. Sometimes a photo was better. I grabbed the best of the best and put that in the book. When we were e-mailing before you liked that I called your work “comics adjacent” and I’m curious why? Does this phrase ring true? First, I just love the word “adjacent.” I love that sneaky silent D. I’m a writer first, a visual artist second, so I have a collection of words I love. Five that come to mind: adjacent, capture, trinket, paraphernalia, haberdashery. I like how they feel when spoken. Haberdashery is like a full sentence. As for A Paris Year being “comics adjacent,” this may be the greatest compliment ever. A Paris Year is a trifecta of words, pictures and layout, which is what also makes a comic book come to life. There is something so very teeth tingling that happens when the perfect sketch is matched with the perfect words on the page and they are rearranged to look as perfect as possible. Making this happen brings me immeasurable joy. I imagine it’s the same with an artist who creates comic books. You described A Paris Year as a version of your sketchbook. Is the practice of keeping a sketchbook important for you and how you work? Is this part of your routine? For me, the only way to get my life together is to keep a journal. In 2010, I made a New Year’s resolution to write in my journal every day of the year. Inside the pages I discovered ways to clear my head, save up enough cash to quit my job, travel around Europe, and eventually move to Paris. Each day in my journal revealed the next step on my journey. 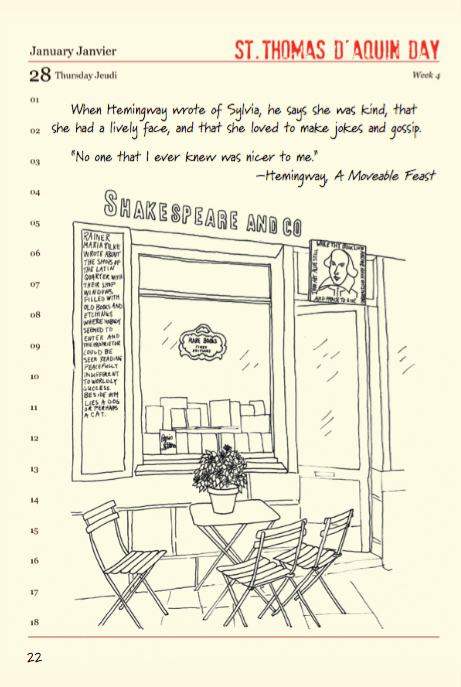 Once in Paris, those journal pages began to include sketches of Paris. Living in Paris for a visual artist is like living inside a jewelry box. Each corner seems prettier than the next. 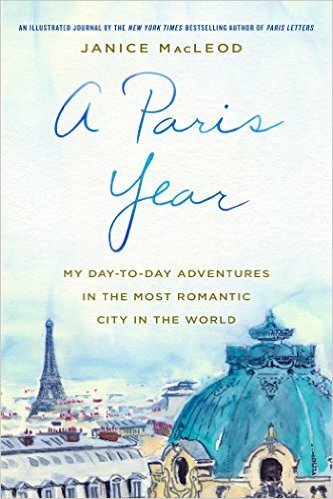 Those sketches led to creating the Paris Letters, plus a book called Paris Letters (a New York Times best seller, which still astounds me), and then A Paris Year, which just came out this past June. So journaling has been very kind to me. Now, even with the new baby, I keep a journal, but I admit, it’s more of a bullet journal. Having a baby takes so much physically and emotionally that mentally there isn’t much left for the page. However, as the baby grows, I know I’ll have more time to dedicate. On occasion, after a string of journal entries that are more truncated than I prefer, I actually have dreams about writing and sketching. Is the font for the book from your handwriting? Heavens no. No one would be able to read my writing. The search for the perfect font is a long, arduous journey. And I’m the graphic designer of the book as well as the writer so you know I was a control freak about the whole thing. There are three fonts. The body copy is called MaryDale. (I used the alternate stylistic set that substitutes a few less quirky letter forms. That lowercase “g” was driving me crazy.) The headlines are Tuesday Script with the occasional Bruselo capital letter tossed in here and there for flare. For this book, or for the letters, what size are you drawing at compared to what we’re seeing? Do you work in a bigger size and shrink it down or how do you work? My drawings are slightly bigger than the final product. I find that it’s easier to get more detail that way. Plus, I like drawing with the UniBall Micro Vision pen. It doesn’t draw as thin as I prefer, but the lines are thinner once I shrink down a sketch. Every sketch requires some digital jiggery-pokery. This shrinking down trick came in handy when creating the book as it was smaller than my original journals. The book was 6 x 9 but my journals are 7 x 10 because they fit better in my satchel (another great word… satchel). That slight difference in the size of my sketches made everything look a little more slick, plus shrinking down sketches makes errors harder to notice. All visual art is really a balance between highlighting the good and hiding the bad. Are you typically drawing and painting these scenes live or do you do it from reference or how do you typically work? What’s the process of making a typical letter? First, a long walk. I don’t know how to be a writer or artist without being a walker. A typical Paris Letter begins with a walk in Paris. I notice the curvy letters on a boulangerie sign, or I meet an interesting storekeeper, or I just come across a lovely street. Then if there is a good place near the scene to sketch (a café or park), I park my caboose and whip out my journal to do a quick sketch and jot down my thoughts. Paris is a bustling city, so sometimes it’s difficult to find a place to sketch. I don’t want to be mowed down by a throng of pedestrians. So I take a photo and sketch it later at home. Then I scan the sketch because if I make a grave error in painting I can always print out another sketch and try again. Then words are added. Everything is scanned in, the aforementioned jiggery-pokery is applied to make up for any fading in the scanning or printing processes, or to just enhance the art, then the letter is printed. I hand-personalize each copy of the letter and mail them out to those who subscribe to my letters on my shop. One reason I ask is because one of the stories in A Paris Year is about your favorite stationary store and the owner who sees his job as finding the best pen for customers and all your work has this handmade aesthetic that you seem to love. Ah yes. The monsieur who made it his life’s work to find the perfect calligraphy pen for those who ask. How great is that? I love the personalized aspect of Paris Letters. I also love the responses… a lady in a retirement village who shares the letter with friends in the cafeteria, a young girl who is inspired to save up to finance a trip to Paris, the boyfriend who buys the letters for his girlfriend after he sees her earmarked copy of Paris Letters on the table. So many great stories can come from one little letter project. When you started out was there a model for the letters that you were looking to? When traveling through Yorkshire Dales in the UK, I came across the painted letters of an artist named Percy Kelly. He wrote letters to his friend Joan on paintings he made with whatever paper he had laying around. I happened to be staying in her house and his paintings were framed and hanging on the walls. Since I was traveling through Europe with one suitcase, this art form appealed to me… small, on the fly, easy to pack. Genius! So what is your relationship to comics? I mean you are in France, one of the global centers of comics culture. In France I’m more of a comic book VIEWER rather than a READER. My French just isn’t that great. Even now. Sigh. But the art is fantastic. In France, Amazon isn’t allowed to discount books by more than 5%, which isn’t enough incentive to keep people out of bookstores, hence bookstores continue to flourish. Plus, in Paris, which is a great walking city, it’s always nice to have a destination in mind. Comic book stores are a great destination. You walk, you peruse, you walk home. A wonderful flâneur activity. Do you have a favorite season in Paris? Autumn. Without question. Autumn. Old cities have old trees, which makes for a lovely place to witness nature’s most brazen costume change. Plus, by autumn the tourists have thinned out, the locals are fresh since their return from their big vacations in August, and fall fashion is draped all over shop windows. It’s a gleeful moment when the new warm coats and boots arrive to Paris. So the book is out, what are you working on now? Do you have another book planned? Or just more letters for the moment? I don’t have a clear direction yet. All I know is that Europe is my beat, and more specifically France. I feel something about Italy on the horizon, but I think for now I’ll write another book about France. In the more immediate future, I’m creating stationery for my Etsy shop. I like giving people tools to write letters. Plus, I’m a paper nerd so designing stationery lets me indulge in my obsession. Now I love Highlander, but do guys everywhere really reference it when they find out your last name? Even at your wedding? Even in Scotland? I was stunned to learn that reading Paris Letters. In my case, it really is like that everywhere. However, now that you ask, I realize now that when I was in Scotland, no one even knew my last name. I stayed at the Citizen M hotel where you check yourself in at one of their computer kiosks. The rest of the time I was on a first name basis with those I met. Pubs in Scotland are more on a first name basis. That settles it. I need to return to Scotland and introduce myself formally to everyone I meet. I’ll report back on the Highlander reference when I do.